Links to this page can be found in Book 5, Day 1 and View C3. 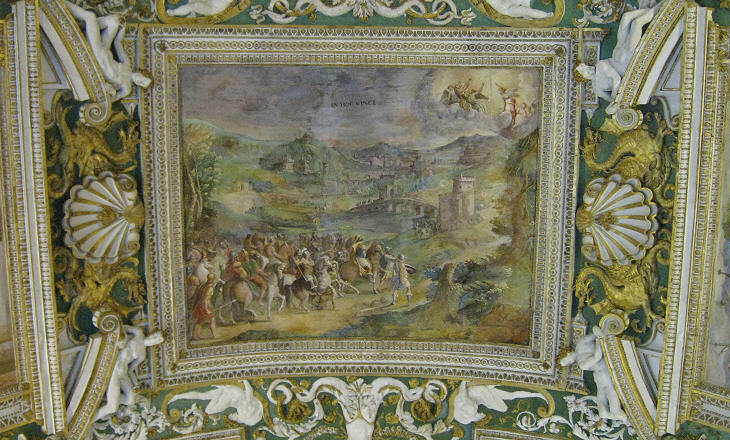 The size of this plate indicates that it was made for Vedute di Roma sul Tevere, the first book of etchings by Giuseppe Vasi; the view was eventually included in Book V which was published in 1754, some ten years later. In his first works Vasi gave more importance to landscape than to monuments and this view of Ponte Milvio includes much of the surrounding countryside. 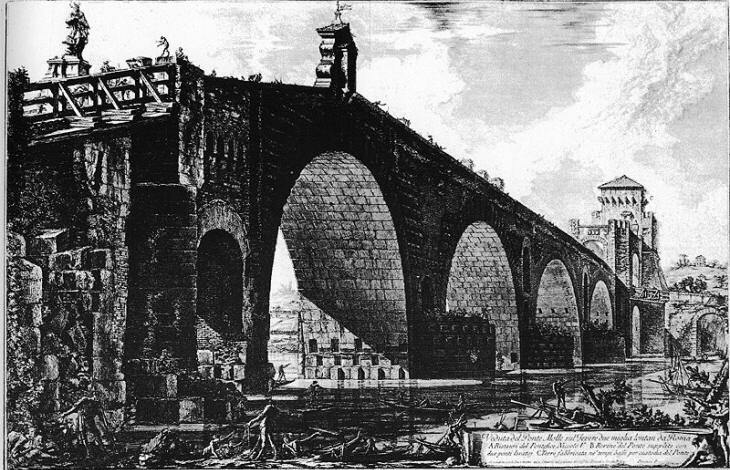 A few years later Giovanni Battista Piranesi drew a much more detailed (and dramatic) view of the bridge. 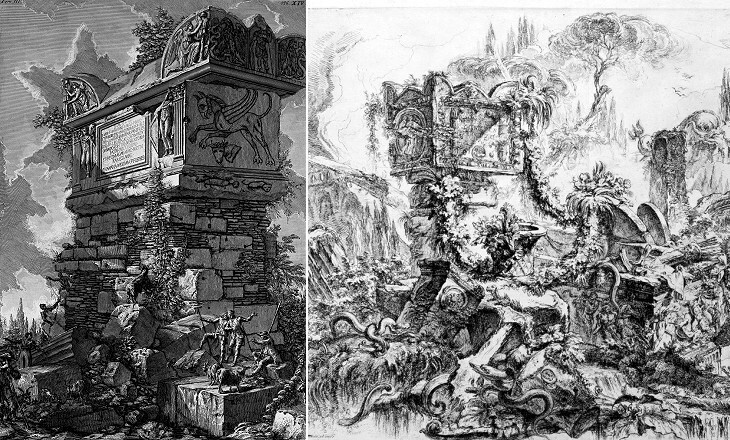 In the description below the plate Vasi made reference to: 1) Via Flaminia; 2) Via Angelica (leading to Porta Angelica). The small 1920 map shows 1) Ponte Milvio (in the past it was more usually called Ponte Molle); 2) Statua di S. Andrea; 3) Tempio di S. Andrea. 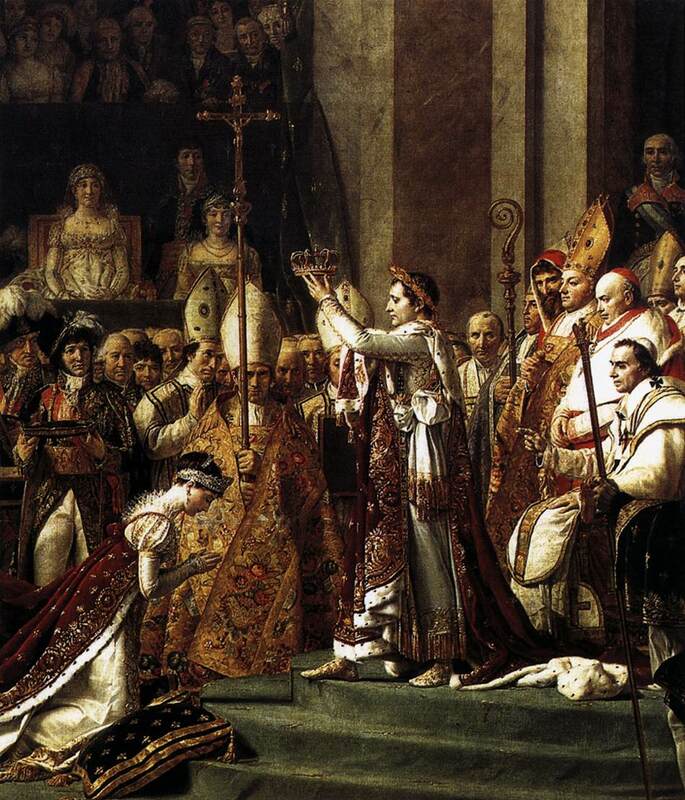 In 1804 Pope Pius VII agreed to crown Napoleon in Notre Dame, the cathedral of Paris; however at the ceremony which took place on December 2, Napoleon suddenly modified the planned ritual and he crowned himself and then his wife in front of the flabbergasted Pope (you may wish to see a famous painting by Jacques-Louis David - it opens in another window). 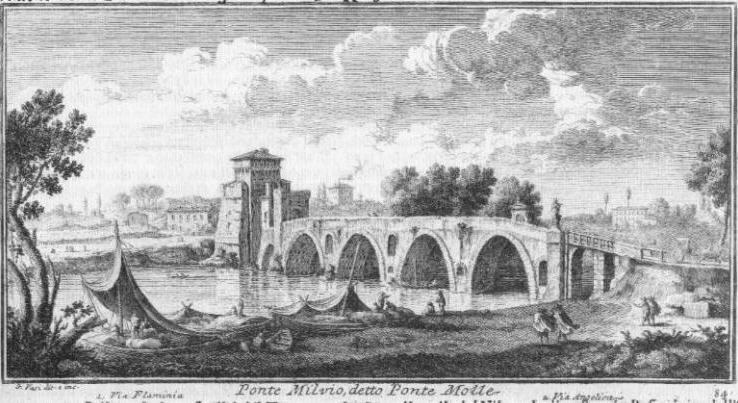 The Pope remained four months in Paris with the hope of obtaining some concessions from the Emperor; upon his return to Rome he was welcomed at Ponte Milvio; for the occasion and at the end of an overall restoration of the bridge, the medieval tower was turned into a sort of triumphal arch by Giuseppe Valadier. The timber structure at the beginning of the bridge was blown up in 1849 during the defence of Rome by Giuseppe Garibaldi. Other changes were made in the late XIXth century when the river banks were raised to reduce the risk of floods. The bridge was built in 109 BC and it was crossed by Via Flaminia; two arches on the side towards Rome are original and retain the ancient travertine decoration; the other parts were rebuilt in the XVth and XIXth centuries. 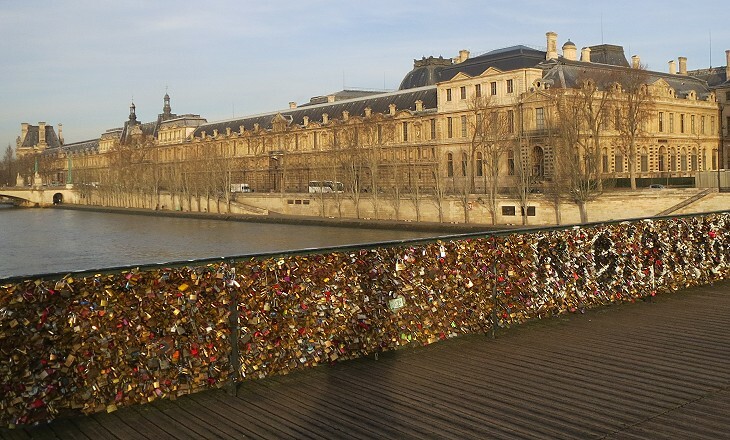 Today Ponte Milvio is reserved to pedestrians and it is chiefly known because lovers lock a padlock at its lamp posts, a practice which began in 2007 and has spread since then to many other bridges around the world, including Pont Neuf in Paris (it opens in another window). The tower at the northern end of the bridge was most likely built by Belisarius during the Greek-Gothic War, but it was largely modified by Pope Nicholas V who rebuilt also two of the central arches; however the completion of this restoration was celebrated in 1458 by his successor Pope Calixtus III; the papal coat of arms is placed between the coats of arms of Cardinal Rodrigo Lenzuoli Borgia (Calixtus' nephew who became Pope Alexander VI in 1492) and that of another member of the Borgia family. The small moon crescent on the right lower corner is a reference to Cardinal Enea Silvio Piccolomini who became Pope Pius II in August 1458. St. John of Nepomuk is the patron saint of those in danger of drowning because in 1393 he was drowned in the Vltava River at Prague by order of Wenceslaus, King of Bohemia; he was canonized in 1729 and in 1731 a statue of him was placed at the southern entrance to Ponte Milvio; according to tradition John was the confessor of the queen and he refused to reveal the name of her lover to the king; this explains the presence of a cupid with a finger on his lips in the lower part of the statue. In 1840 the statue of St. John of Nepomuk was relocated to the right side of the entrance to the bridge and it was replaced by another (rather ugly) statue. 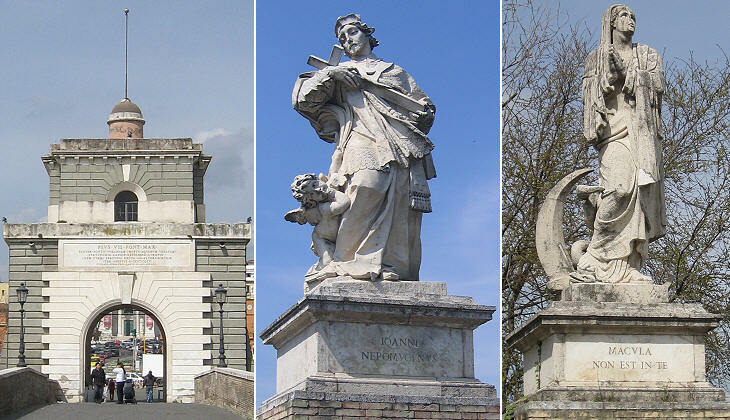 In 1805 the entrance to the other side of the bridge was embellished with two statues by Francesco Mochi which were initially made for S. Giovanni dei Fiorentini. Ponte Milvio is associated with the battle fought in October 312 AD at Saxa Rubra (near today's Malborghetto) between Constantine and Maxentius and which ended near Ponte Milvio when Maxentius drowned in the river. According to tradition, before the battle Constantine had the vision of a cross accompanied by the words EN TOUTOI NIKA (Greek) - IN HOC SIGNO VINCES (Latin) (by bearing this symbol you will win). The image used as background for this page shows a detail of the the Vision of Constantine at Scala Regia by Gian Lorenzo Bernini. You may wish to see the Vision of Constantine at Battistero Lateranense by Giacinto Geminiani which depicts Ponte Milvio. 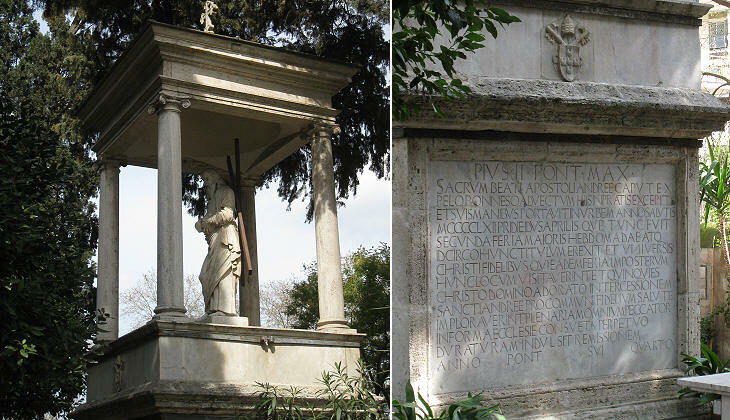 Close to Ponte Milvio, in a small square between tall buildings, there is a small cemetery where the tombs are grouped around a statue of St. Andrew. It was erected here in 1462 by Pope Pius II to celebrate the arrival to Rome of the head of the saint from Patras in Greece, which had been conquered by the Ottomans in 1460. You may wish to know more about this topic. 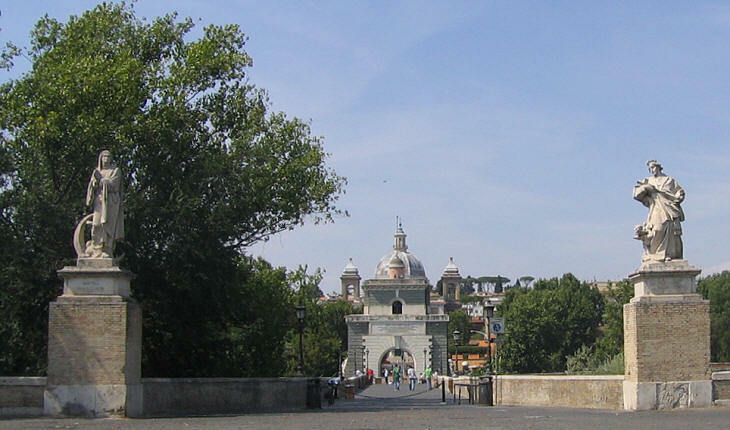 In 1553 Pope Julius III built a chapel along Via Flaminia, not far from his villa, to comply with a vow he made in 1527, when he was a bishop; in June of that year he had been given as a hostage by Pope Clement VII to Emperor Charles V as part of a truce agreement reached after the Sack of Rome; the chapel was dedicated to St. Andrew because the future pope was freed on November 30 1527, St. Andrew's Day, whereas other hostages were killed at Campo de' Fiori. The church was designed by il Vignola. It vaguely resembles the Pantheon, but its dome is elliptical. 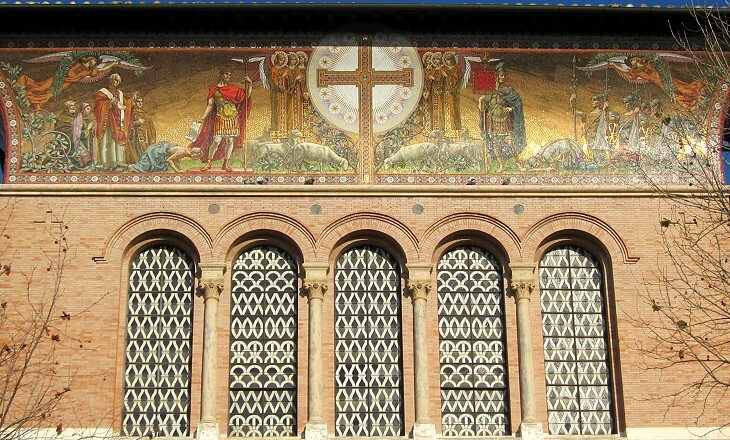 Its neat design was praised in the XIXth century: This graceful temple is one of Vignola's best works. 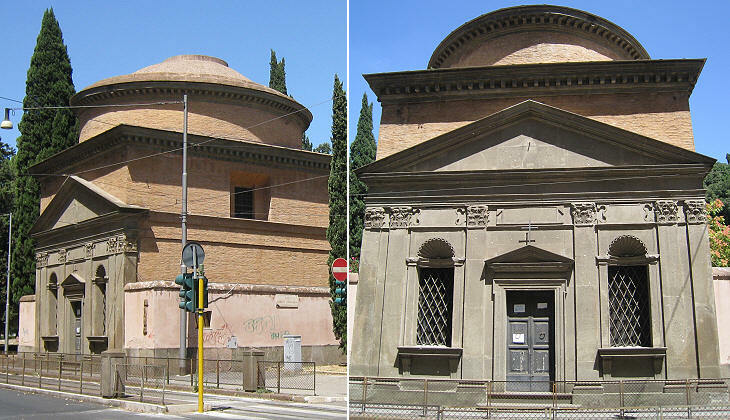 In simplicity and regularity of plan this little edifice rivals the temples of ancient Rome (..) its vaulted roof rises on three steps, resembling that of the Pantheon. Immediately after Ponte Milvio the road splits into Via Flaminia leading to Rimini and into Via Cassia leading to Florence. 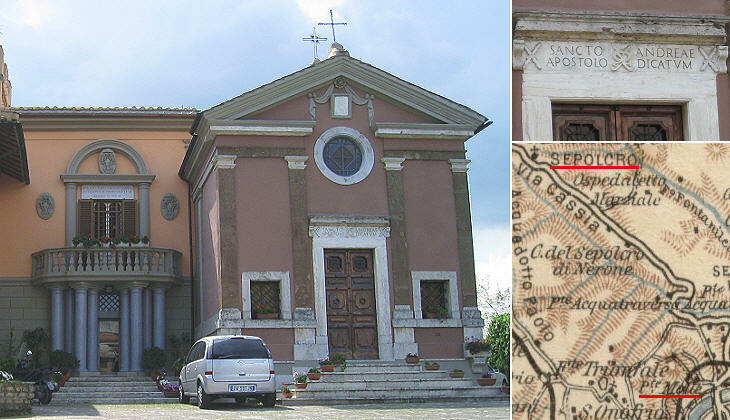 In 1690 Cardinal Antonio Pignatelli, prior to becoming Pope Innocent XII, dedicated a chapel to St. Andrew inside a property of his family at the VIth mile of Via Cassia. Today the casino of the villa houses a nunnery and a school. The neighbourhood is known as Tomba di Nerone because in the Middle Ages a Roman sarcophagus was believed to be the tomb of Emperor Nero. Due to the association with Nero, who was regarded as a sorcerer, the monument had a bad reputation and many unfortunate events which occurred in the area were attributed to it, including the killing of a Bavarian countess travelling as a pilgrim to Rome in 1844, as reported by Charles Dickens. 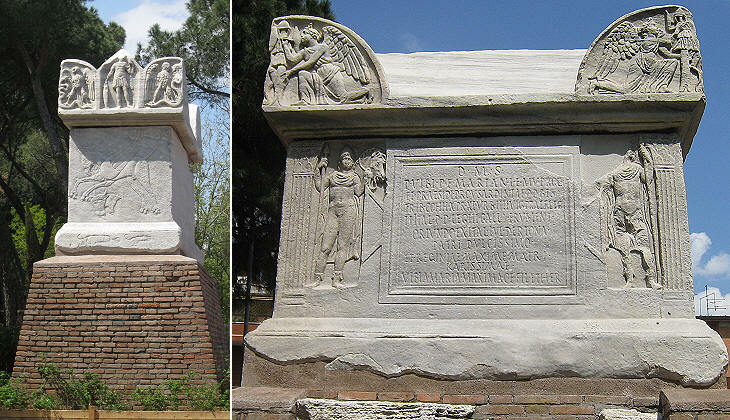 The sarcophagus was dedicated by Vibia Maria Maxima to her father Vibius Marianus who held several minor positions in the Roman army in ca 220-240 AD; it is finely decorated with reliefs showing among other subjects, Castor and Pollux, the demigods who protected Rome. Next plate in Book 5: Porto di Ripetta. Next step in Day 1 itinerary: Casino di Papa Giulio III. You may wish to move on along Via Cassia. Or dovendo da questo principiare il nostro dilettevole viaggio, non bisogna, mio Lettore gentile, mirare solamente la semplice struttura di esso, ma scorrere più presto col pensiero a rammemorarsi quei tanti Eroi, che passando per esso vennero a Roma vincitori di Regni, e Provincie le più vaste e lontane; ed insieme quanti Re e Capitani prigionieri, o pur tributarj, ed officiosi vi possarono per venire a prestare omaggio al senato e popolo romano. Da Emilio Censore, che lo edificò fu chiamato Ponte Emilio, dipoi Milvio, ed ora Ponte Molle vien detto. Dell'antico non ritiene altro, che la torre fatta da Bellisario, e i piloni sopra cui Niccolò V rifece il ponte. Ne' secoli antichi si difendevano fin quì le oscenità del gentilesimo, perciò era frequentata questa contrada da Nerone. In oggi però dal medesimo ponte principia a farsi vedere la pietà de' Fedeli, e la santità della nostra Religione, essendo sopra di esso collocata un'immagine della santissima Vergine, ed al fianco la statua di s. Giovanni Nepomiceno. Giulio III. per una grazia ricevuta dal santo Apostolo mentre era Prelato, crede questa piccola chiesa con disegno però di Giacomo Barozio da Vignola, e se ne vede in stampa la pianta, lo spaccato, ed il prospetto.